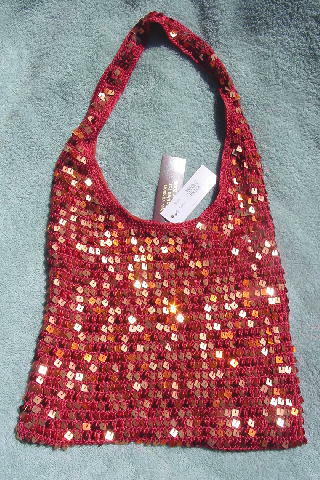 This never-used fabric and knit purse has square light gold and iridescent orange sequin accents. The knit is in a dark orange-brick color. It has a terracotta full lining and a 1" square velcro closure. One has the style (SB 6007) and color (brick) and says designed in Italy. 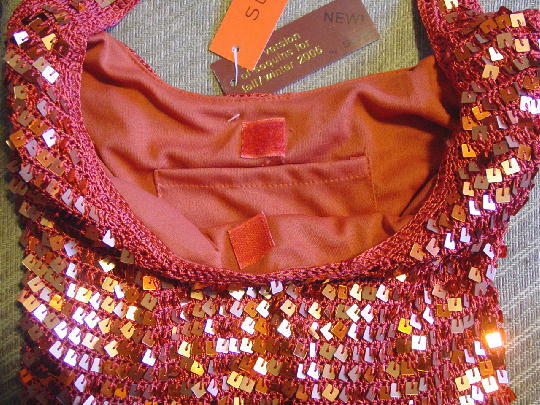 The other tag says New version of sequins for fall/winter 2005 New! by Suzie! It's light in weight and nicely made. It can be worn in the daytime or evening. She bought two identical ones for a movie. The other (identical) one was worn with a long peasant or BoHo skirt, sandals, and a large belt worn low.